Thank you all for the lovely comments on my photos from Portugal! It really is a wonderful place to visit. I highly recommend it. Since making my biking/travel wardrobe for The Netherlands, I've pretty much been set on travel clothes. For that trip, I made 6 tops out of solid-colored wicking fabric and added 3 print skirts to my already broad repertoire. Throw in a dress or two and you've got two weeks worth of outfits that you might not even get sick of. 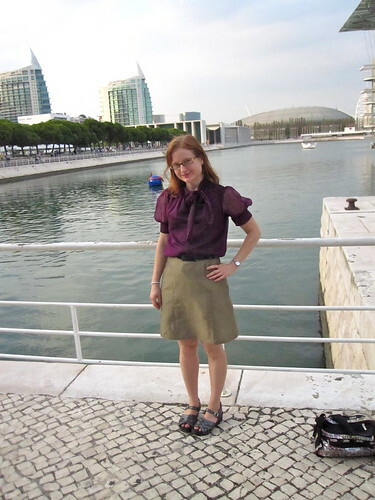 However, for Portugal the weather was likely to be a little cooler than my sleeveless tops and summer skirts would work for, and plus I always need an excuse to do some sewing! I made four new items and in writing about them I realized that all of them are TNTs, or at least based on a TNT. Am I getting boring? I hope not. I think it's that with 275 pattern reviews (plus all the patterns sewn before I discovered PR and those I haven't gotten around to reviewing), I've got a lot of bases covered. I'm also getting better at adapting patterns I already know that go together nicely and fit well rather than having to start over each time. 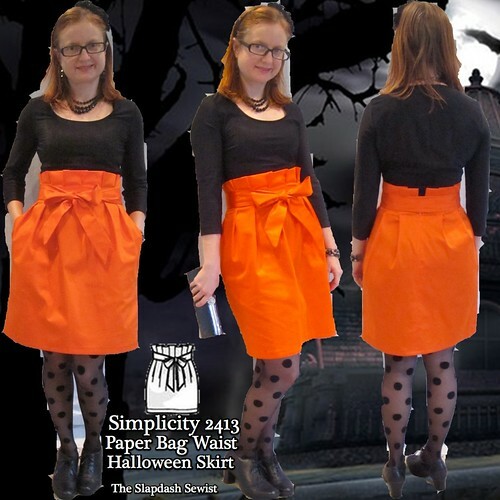 The skirts I made for The Netherlands are mostly cotton, which sometimes doesn't interact well with tights, so I wanted a more tights-oriented skirt. I turned to--what else--TNT A line skirt Simplicity 2211. This is a recent addition to my lexicon, as I only made it for the first time over the summer. I've now made it 4 times, and this certainly isn't the last. I used a bronze silk dupioni I bought in NYC several years ago. It was intended for another project but I kept using bits of it here and there and finally there wasn't enough for the original plan. Also, I am (as ever) working on Too Good to Use. Sometimes having a plan for something makes it TGTU. If I really cared about the planned project, it would have been made sometime in the last four years. It wasn't. Better to make it into something I will wear than continue to "save" the fabric indefinitely. The challenge with this was choosing the right side and then keeping all the piece straight. I tore little pieces of tissue paper, marked them with CF, SF, SB, and CB and then pinned them on the wrong side of the respective pieces. To add body to the dupioni, I underlined in silk organza using the faux Hong Kong finish technique, as described here. 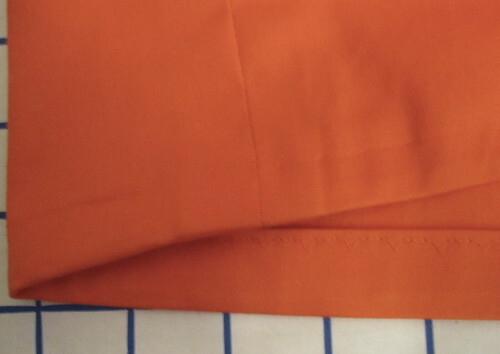 You cut the underlining 1.5 inches wider than the fashion fabric, line up the cut vertical edges and sew right sides together (so the underlining is kind of bulging over the fashion fabric), then turn it right-side out, letting the underlining roll over to cover the seam allowances. It creates such a high-end looking finish! 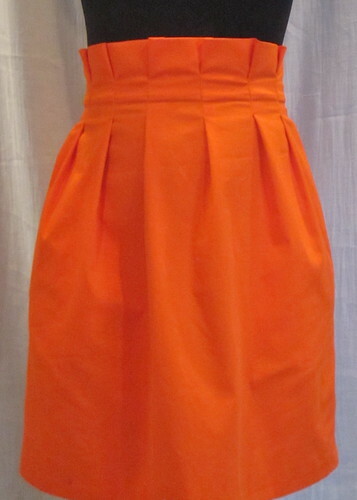 To complete the high-end look, I put in a hand hem. 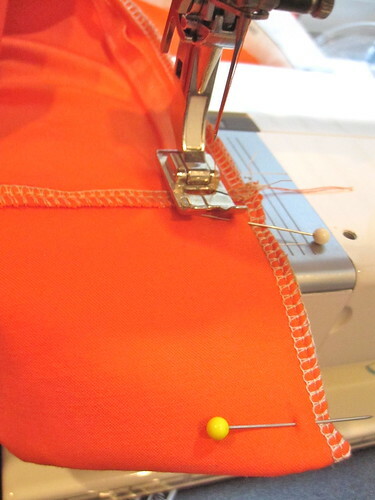 I don't usually do hems by hand. The machine blind stitch is truly nicer than anything I've ever achieved by hand. 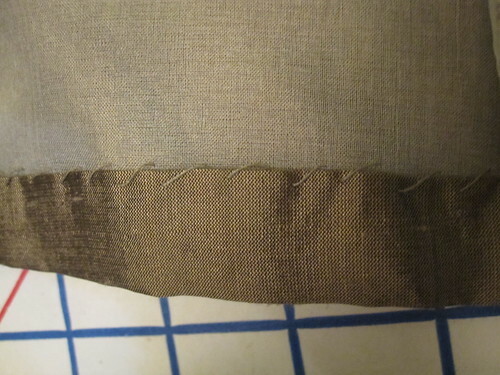 But here I was able to sew the hem allowance only to the underlining, for a completely invisible hem. 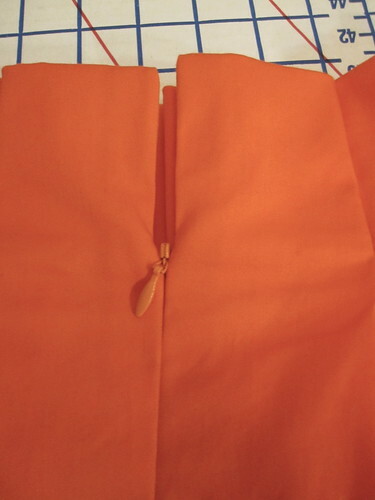 The waist is bound with a straight-grain strip of fabric. I sewed it first to the wrong side, stitching a ribbon in place as I sewed on the binding to ensure the waist would remain stable. 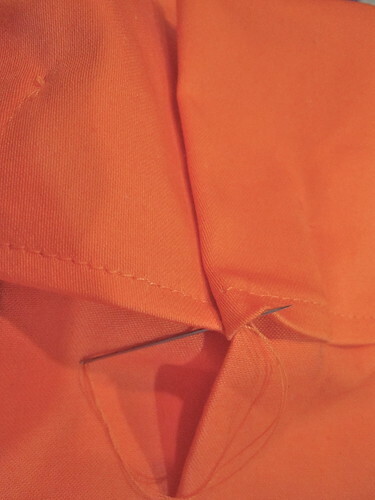 Then I folded it over to the right side and topstitched, using my walking foot to ensure even feed. 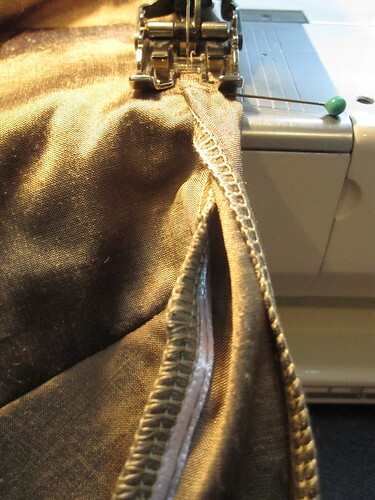 I left a tab overlapping the zipper opening, and sewed in a snap for closing. I find snaps more secure than hooks-and-eyes. 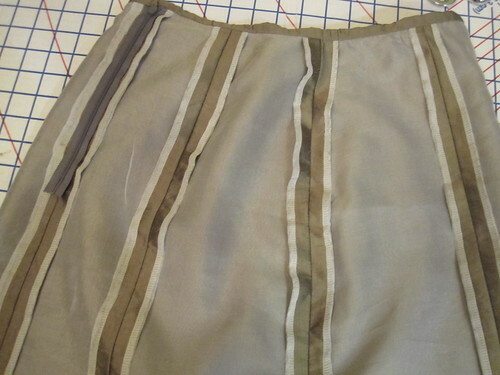 This still isn't a great skirt for sitting in; the dupioni wrinkles like crazy despite the underlining. So I think I only wore it twice, on the days we didn't take any train rides. It is gorgeous, though, and I felt very luxe in this 100% silk outfit. The blouse is McCall 5708 made out of Vera Wang silk from that Fabric.com $1.99/yd blowout a couple years ago. The photos were taken near the Oceanario (aquarium) in Lisbon. All photos for S2211 are here. I made use of my waterfall cardigan t-shirt variation pattern right away for this gorgeous wool sweaterknit I bought in New York last Fall. It was $10/yd and I only bought one yard, thinking I'd make a pullover sweater (aka long-sleeve t-shirt). To get the waterfall cardigan out of it, I had to cut the sleeves on the crossgrain. Before doing so I tested the fabric and it appeared to have stretch. Well, clearly my stretch test was not sufficiently rigorous because I could barely pull the sweater on, the sleeves were so tight. Dang it! Stupid, stupid mistake. I contemplated it and then found scraps large enough to add gussets under each arm. I carefully cut away the serged seams as narrowly as possible, and then added diamond-shaped patches (you can see them in the photo if you look carefully). I should have made the gussets extend longer on the arms, all the way to the elbow, but the sweater is wearable now. 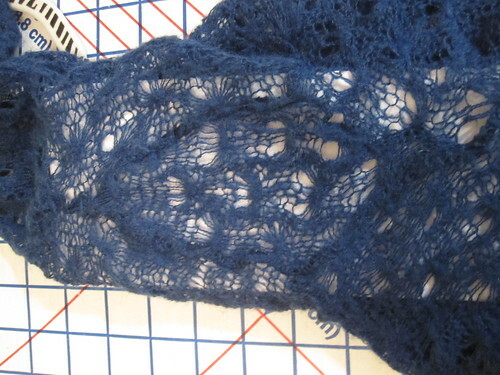 It is surprisingly warm, even with the lacy pattern. 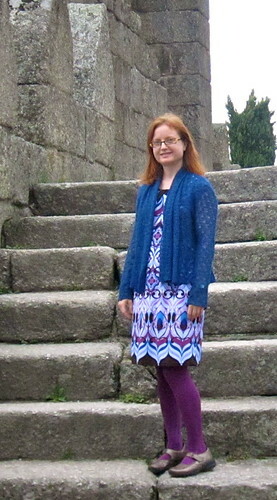 I am wearing it here with Butterick 5382 in the fabric gifted to me by Marji. Please excuse my appearance. It looks like I forgot to put on lipstick that day. Also, I look a little bit like I'm upset but I was actually having a lot of fun! 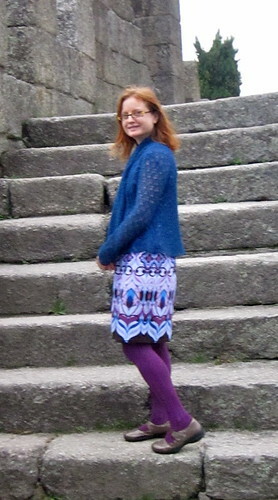 These photos were taken in the Castelo in Guimaraes. It's an 11th century (? as I recall) ruin that has been rebuilt enough to be safe to scramble around in. It is free to enter and you can climb up and down the walls and staircases. While we were there some students were having some sort of initiation ceremony, it looked like. Students in Portugal wear capes or robes, so three girls flowed by in their long robes, climbed a staircase, and called something out from the top of the walls. The initiates down below, wearing street clothes and straw hats, had to shout something in response, dance a jig, do pushups, and generally carry on. It was so fun--I felt like I was at Hogwarts! All photos for the waterfall cardi are here. All is well with me through Hurricane Sandy. We got a lot of rain and wind, but I have power and my roof didn't leak. Those of you still dealing with it, take care and my fingers are crossed you get off as easy as I did. Back from vacation, back to real life. Le sigh. I have been back for more than a week but you know how it is to readjust (and the inevitable cold from flying). Portugal was beautiful and easy to get around. The people were all lovely and kindly spoke English. I speak passable tourist-level French and Spanish and figured Portuguese wouldn't be too much of a stretch but, boy, was I wrong! The spelling and grammar are similar, so I could read things well enough to get the gist, but the pronunciation is so different that I couldn't understand a word. 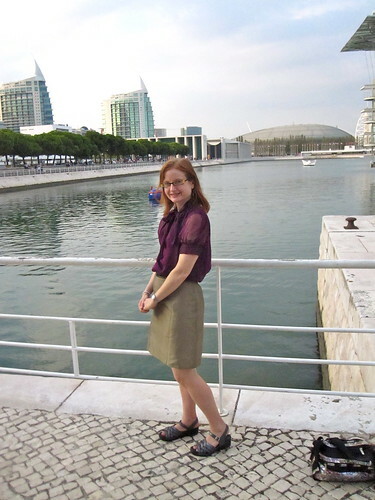 We visited Lisbon, Porto, and Guimaraes, a small city about an hour from Porto. Guimaraes was named European City of Culture for 2012, so it was a great year to visit. A lot of money had been poured into it and has a lot of interesting history. 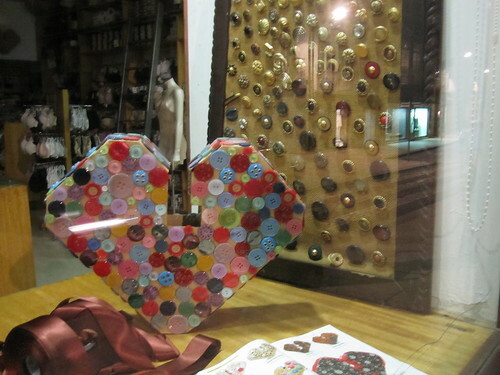 The button sculpture at the top is the Guimaraes 2012 logo, a G turned on its side so looks a bit like a heart. I managed to encounter some interesting textile and fashion related stuff along the way. 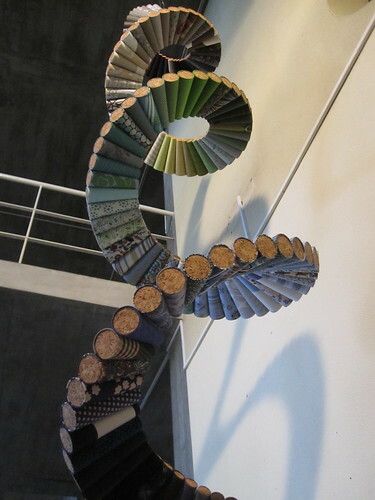 The fabric sculpture at leftwas in the Teleferico station in Guimaraes (the sky gondola that takes you to the top of Mt. Penha). The fabrics are arranged in the color of a rainbow, and there was also a flag garland. Unexpected little piece of art! 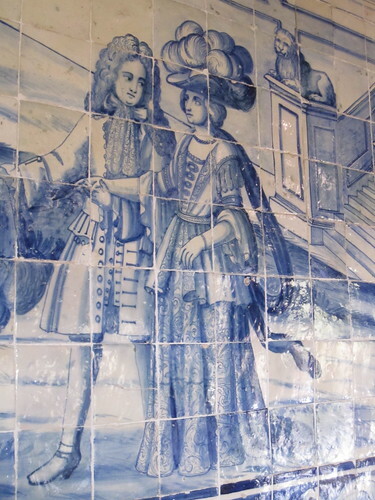 On the right is an azulejo, blue-painted tile, from the Palacio Nacional in Sintra. I loved the woman's hat! 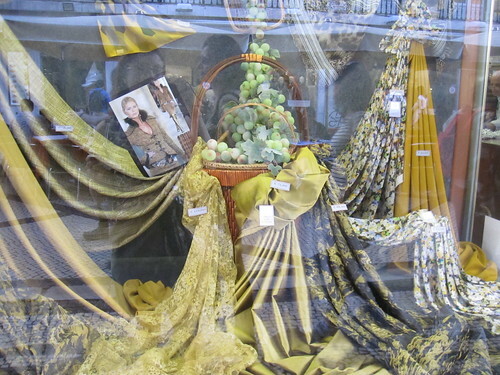 I was amazed to encounter a fabric store on the main tourist drag of Rua Augusta in Lisbon. The window displays were gorgeous, with tonal fabrics draped artistically and inspiration photos showing how the fabrics can be used. I have to confess, though, that I didn't even go in the store. The fabrics seemed to start around 40 Euro/meter, and while I'm sure I could have found something gorgeous I just don't have a need for a luxurious and luxuriously expensive souvenir fabric. 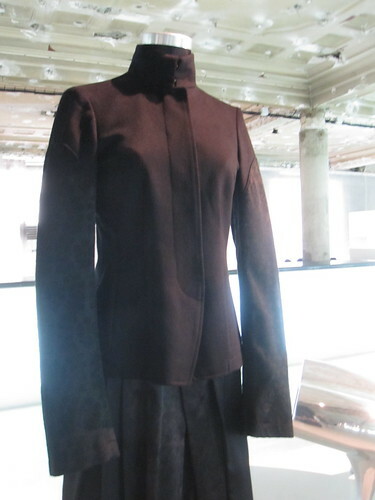 In Lisbon the Museu do Design e da Moda (museum of design and fashion) is free to visit. It's in an old bank building, and the permanent exhibit downstairs is really cool. It's a chronological look at design and fashion over the past 100 years, with about 8 different "stations" as you walk in a circle through time. There wasn't a whole lot of fashion--a lot more home and industrial design--but I really liked this coat from Dries van Noten. The textile-related photos from my trip are here. You can see all the photos from my trip here, and view them as a slide show here. There are a few new wardrobe elements in them which I will write about soon!